"Survival is the best revenge." John Kang (Lamas) is a mild-mannered L.A. cop who prefers to teach Martial Arts to children and other cops than being out on the street. When his friend and partner Paddy (Pierpoint) convinces him to get involved in a gang war between the Cambodian mafia and the Russian mafia, Kang has no choice because he speaks fluent Cambodian. As if being caught in the middle of a mob war wasn’t enough, the super-evil Prince Samarki (Lew) is running around killing everyone, including people close to Kang. Samarki has the ancient Cambodian mysticism instilled in him by Lord Mao Tan (Trinidad), but Kang has an ace in the hole with mystic-on-the-side-of-good Buun Som (Mako). So now the stage is set for the ultimate showdown. Will it be BLOOD FOR BLOOD after all? This is definitely one of Lamas’ best - he has a great entrance and from then on it’s a blur of awesome hair, awesome Karate moves, awesome one-liners (with plenty of 90’s references and humor), awesome gun battles, and did we mention awesome hair? While the casting of Lorenzo Lamas as a Cambodian named Kang may seem odd...okay, it is odd, but who cares? Plus the movie is chock full of other fan favorites such as James Lew, who plays a similar character in American Ninja 5 (1993), among other movies - so now you REALLY don’t need to see AN5. We always like seeing Mako, and here he has his usual small role. Steven Vincent Leigh of China White (1989) fame has some great clothes, and fan favorite name Arsenio “Sonny” Trinidad makes a short appearance as well. 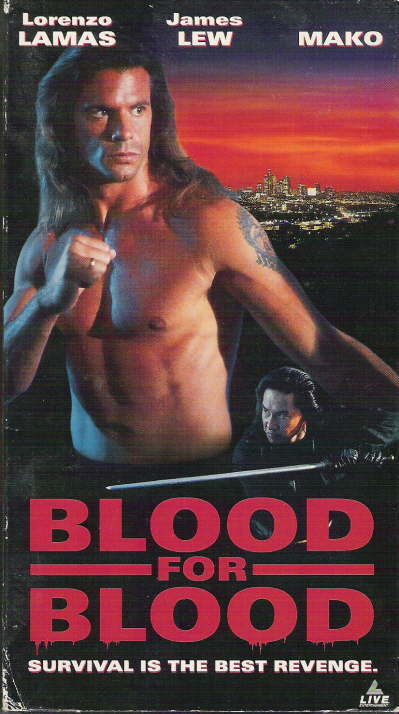 Blood For Blood has all the great 90’s video-store action you want, including the time-honored “flying through the air sideways while yelling and shooting” move, and this is one of the first instances of “Lampfighting” that we can recall seeing. Naturally fights occur in bars and abandoned warehouses, where they should. At one bar/club, they’re actually showing Shootfighter (1992) on a screen. Because the same producers are involved, it saves money. But Kang also has a sensitive side, as represented by his wife and daughter (DiLascio and Smith respectively). His daughter plays with stuffed bears and adds Kang’s LAPD badge to one of them, while one bear arrests another. Someone should set up a playdate with the “I’m gonna smoosh you” kid from A Time To Die (1991). While to some, Blood For Blood may seem like standard action material, the presence of Lamas elevates it, as do his co-stars. We thoroughly enjoyed it, and we recommend it. I love the tag lines to these films. Wish I could have a job writing them. Not sure about the tag line to this one. I'm pretty confident that there's a whole range of 'revenge' which is a lot better than 'survival'. Agreed, it doesn't make much sense, but it's cool to read for a second. One of our personal favorites is the tagline to the Mark Dacascos movie, Sabotage: "The dark heart of the CIA beats to a secret agenda." Thanks! Definitely. Lamas at his best.